The bottom line is 46 CFR Subchapter M is drastically changing the landscape of towing operations within the United States. Some impacts we have identified and other will come to light as time passes. As the Subchapter M compliance deadline approaches on July 20, 2018, I have had the chance to discuss these new laws and their impact with a variety of Assured’s with diverse backgrounds and widely varying commercial tug operations. 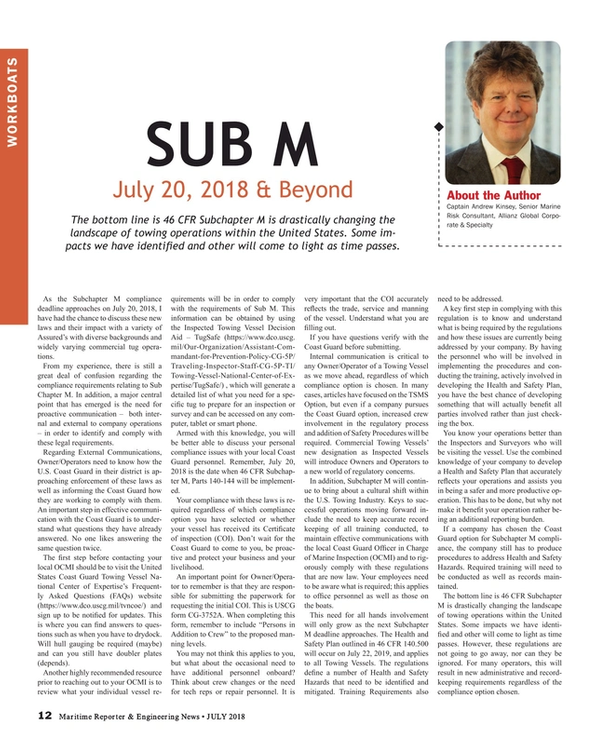 From my experience, there is still a great deal of confusion regarding the compliance requirements relating to Sub Chapter M. In addition, a major central point that has emerged is the need for proactive communication – both internal and external to company operations – in order to identify and comply with these legal requirements. Regarding External Communications, Owner/Operators need to know how the U.S. Coast Guard in their district is approaching enforcement of these laws as well as informing the Coast Guard how they are working to comply with them. An important step in effective communication with the Coast Guard is to understand what questions they have already answered. No one likes answering the same question twice. The first step before contacting your local OCMI should be to visit the United States Coast Guard Towing Vessel National Center of Expertise’s Frequently Asked Questions (FAQs) website (https://www.dco.uscg.mil/tvncoe/) and sign up to be notified for updates. This is where you can find answers to questions such as when you have to drydock. Will hull gauging be required (maybe) and can you still have doubler plates (depends). Another highly recommended resource prior to reaching out to your OCMI is to review what your individual vessel requirements will be in order to comply with the requirements of Sub M. This information can be obtained by using the Inspected Towing Vessel Decision Aid – TugSafe (https://www.dco.uscg.mil/Our-Organization/Assistant-Commandant-for-Prevention-Policy-CG-5P/Traveling-Inspector-Staff-CG-5P-TI/Towing-Vessel-National-Center-of-Expertise/TugSafe/) , which will generate a detailed list of what you need for a specific tug to prepare for an inspection or survey and can be accessed on any computer, tablet or smart phone. Armed with this knowledge, you will be better able to discuss your personal compliance issues with your local Coast Guard personnel. Remember, July 20, 2018 is the date when 46 CFR Subchapter M, Parts 140-144 will be implemented. Your compliance with these laws is required regardless of which compliance option you have selected or whether your vessel has received its Certificate of inspection (COI). Don’t wait for the Coast Guard to come to you, be proactive and protect your business and your livelihood. An important point for Owner/Operator to remember is that they are responsible for submitting the paperwork for requesting the initial COI. This is USCG form CG-3752A. When completing this form, remember to include “Persons in Addition to Crew” to the proposed manning levels. You may not think this applies to you, but what about the occasional need to have additional personnel onboard? Think about crew changes or the need for tech reps or repair personnel. It is very important that the COI accurately reflects the trade, service and manning of the vessel. Understand what you are filling out. If you have questions verify with the Coast Guard before submitting. Internal communication is critical to any Owner/Operator of a Towing Vessel as we move ahead, regardless of which compliance option is chosen. In many cases, articles have focused on the TSMS Option, but even if a company pursues the Coast Guard option, increased crew involvement in the regulatory process and addition of Safety Procedures will be required. Commercial Towing Vessels’ new designation as Inspected Vessels will introduce Owners and Operators to a new world of regulatory concerns. In addition, Subchapter M will continue to bring about a cultural shift within the U.S. Towing Industry. Keys to successful operations moving forward include the need to keep accurate record keeping of all training conducted, to maintain effective communications with the local Coast Guard Officer in Charge of Marine Inspection (OCMI) and to rigorously comply with these regulations that are now law. Your employees need to be aware what is required; this applies to office personnel as well as those on the boats. This need for all hands involvement will only grow as the next Subchapter M deadline approaches. The Health and Safety Plan outlined in 46 CFR 140.500 will occur on July 22, 2019, and applies to all Towing Vessels. The regulations define a number of Health and Safety Hazards that need to be identified and mitigated. Training Requirements also need to be addressed. A key first step in complying with this regulation is to know and understand what is being required by the regulations and how these issues are currently being addressed by your company. By having the personnel who will be involved in implementing the procedures and conducting the training, actively involved in developing the Health and Safety Plan, you have the best chance of developing something that will actually benefit all parties involved rather than just checking the box. You know your operations better than the Inspectors and Surveyors who will be visiting the vessel. Use the combined knowledge of your company to develop a Health and Safety Plan that accurately reflects your operations and assists you in being a safer and more productive operation. This has to be done, but why not make it benefit your operation rather being an additional reporting burden. If a company has chosen the Coast Guard option for Subchapter M compliance, the company still has to produce procedures to address Health and Safety Hazards. Required training will need to be conducted as well as records maintained. The bottom line is 46 CFR Subchapter M is drastically changing the landscape of towing operations within the United States. Some impacts we have identified and other will come to light as time passes. However, these regulations are not going to go away, nor can they be ignored. For many operators, this will result in new administrative and record-keeping requirements regardless of the compliance option chosen.